Jazkarta is committed to using open source software as the basis for all of our projects. Only open source provides the security, flexibility, and openness that our clients need. Open source software is released in source code form, under a license that allows users to make modifications to it. Such software is created by a community of developers in a collaborative, public manner, and released without license fees. Larger open source projects may have contributors from dozens of companies that use and depend upon it, as well as hobbyists and researchers. We are open source evangelists. 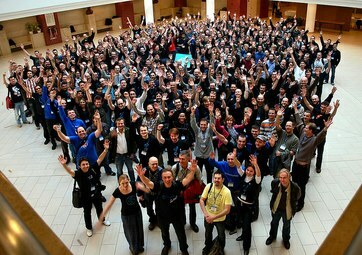 We passionately believe in the value of open source software and the power of the communities that produce it. It's not just a question of cost - open source provides advantages in security, flexibility, and openness that are unmatched by commercial systems. And although open source software does still have costs associated with it, these do not take the form of ongoing license fees. In a well executed open source project, costs are frequently lower than proprietary solutions.There are also policy-based reasons for adopting open source. Compared to proprietary alternatives, open source software provides transparency and lack of vendor lock-in. The advantages of open source software go beyond financial considerations. Security - Keeping source code open increases its security and quality through continual inspection and peer review. Open source software has a history of rapid response to security threats, and a lower mean time to ﬁx reported bugs. Flexibility - Open source software can change as you need it to. You are not restricted to a ﬁxed feature set, you can customize the system to ﬁt your requirements. If the right tool doesn't exist to support your needs, we can build it ourselves and even donate it back to the software community. Transparency - Open source enables you to leverage a culture of trust and openness, rather than secrecy. With access to the source code, you can verify everything a software vendor delivers. Vendor choice - With open source you will be able to ﬁnd people all over the world with the right knowledge and skills to develop your projects. Stability - Open source allows you to have full control over your code base, and you own your customizations. If a proprietary system gets bought out or shuts down, its users can be stranded. Iterative development allows you to grow the system with your requirements, rather than being tied to a vendor's prescribed upgrade path.